offers a programme centered on microwave engineering and photonic technologies which ensures that students acquire advanced and cross-disciplinary expertise. In a context of increasing demand of research and industrial applications around these topics, EMIMEO Masters is a concrete solution to improve the number of highly qualified students for feeding the research labs and for meeting the demand of industry. EMIMEO is a thoroughly integrated programme with a jointly developed curriculum. 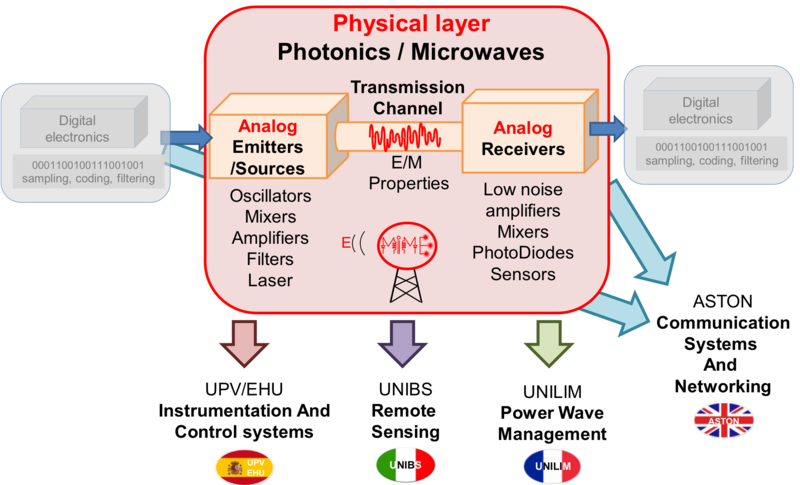 Areas covered range from the fundamentals of microwave electronics and photonics to their implementations with new technologies in wired and wireless communications, moving from components to system architectures for communication systems and networks. As a graduate of the eMIMEO Master, students will have thorough scientific knowledge from analogue microwave electronics and photonics. Please refer to the Application guide to create your account and apply online. An Erasmus Mundus Joint Master Degree (EMJMD), is a prestigious, integrated, international study programme, jointly delivered by an international consortium of higher education institutions. EMJMDs award EU-funded scholarships to the best student candidates applying under annual selection rounds. Study must take place in at least two of the Programme countries. Part of the studies can also take place in a Partner countries if there is a partner-country institution involved.